If you’re the type of person who is always looking for ways to enhance the attractiveness of your home environment, you should be considering bamboo. Yes, bamboo is actually a plant that is a member of the grass family. As it turns out, there are many bamboo-themed decorating ideas that will keep you on the trendy side of cool and help you to be eco-friendly at the same time. How so? While trees can take decades to grow to a grand stature, bamboo is a fast-growing grass that will grow to full maturity in a mere fraction of that time frame. Therefore, using bamboo over wood is definitely better for the environment. What follows are some tips on how you can accessorize your home with bamboo. Bamboo is a very versatile material that can be used for furniture — think chairs and beds — that are aesthetically pleasing, weather resistant, and trendy. In addition to furniture, bamboo can be used to make other things such as shelving units, cabinets, and lighting fixtures. Installing bamboo window blinds and shades in your home will make you look like an interior design guru since they are trendy and simply look great. Choose from a range of colors and textures to elevate your window coverings to something a lot more elegant than plastic materials. If shades and blinds aren’t your thing, you can also get yourself some bamboo curtains as the natural fibers contained in bamboo can be spun to make yarn. Traditional hardwood and laminate flooring are generally regarded as better options than carpeting. However, if you want something a little more trendy and unique, then consider installing bamboo flooring instead. 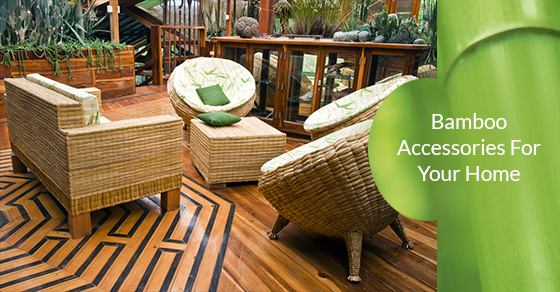 Cost effective, durable, and eye-pleasing, bamboo flooring will give any room in your home a unique look of its own. Painting or wallpapering are the two popular options when it comes to updating walls. However, you might want to add bamboo wall coverings to the list since that might very well be the next big thing in home renovations. You can get modern wall coverings constructed from bamboo in order to do something a little bit different that will have maximum impact. As you can see, accessorizing your home with bamboo is within reach. Bamboo is both attractive and cost-effective, which means that it would be prudent to consider it the the next time you’re interested in updating the look of your home.